HomeTrendingThe world's last male northern white rhino, Sudan dies and the Internet cannot handle it! 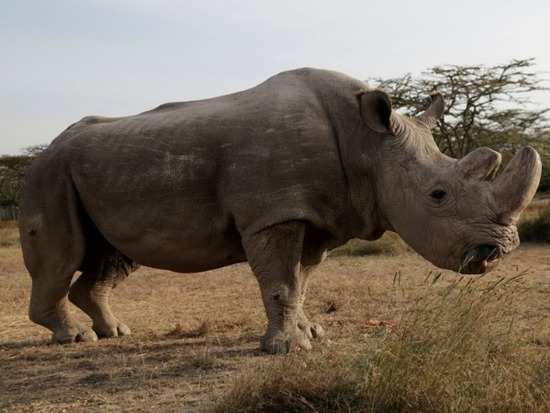 The last male northern white rhinoceros died on Monday at the Ol Pejeta Conservancy in Kenya following a series of infections and other health problems. At 45, Sudan was an elderly rhino but his death was not unexpected. Hunted to near-extinction, just two northern white rhinos now remain: Najin, Sudan’s daughter, and Fatu, his granddaughter, both at the conservancy. The prospect of losing the charismatic animals has prompted an unusual scientific effort to develop new reproductive technology in hopes of saving them. "This is a creature that didn’t fail in evolution," said Thomas Hildebrandt, head of reproduction management at the Leibniz Institute for Zoo and Wildlife Research in Berlin and one of the project’s leaders. "It’s in this situation because of us," added Thomas. Northern white rhinos, a subspecies of the more populous southern white rhinos, once roamed the grasslands of east and central Africa. In 1960, there were approximately 2,000. How disheartening, right? 1The world's last male northern white rhino, Sudan dies and the Internet cannot handle it!